What are the 3 treasures in this dish? They are dried mushrooms, wood ear fungus and cloud ear fungus. Verdict - very aromatic, fragrant and tasty dish. Looks dark but it is a nice dish that goes well with white rice. Heat oil, saute ginger, pandan leaves and fermented black beans until aromatic. 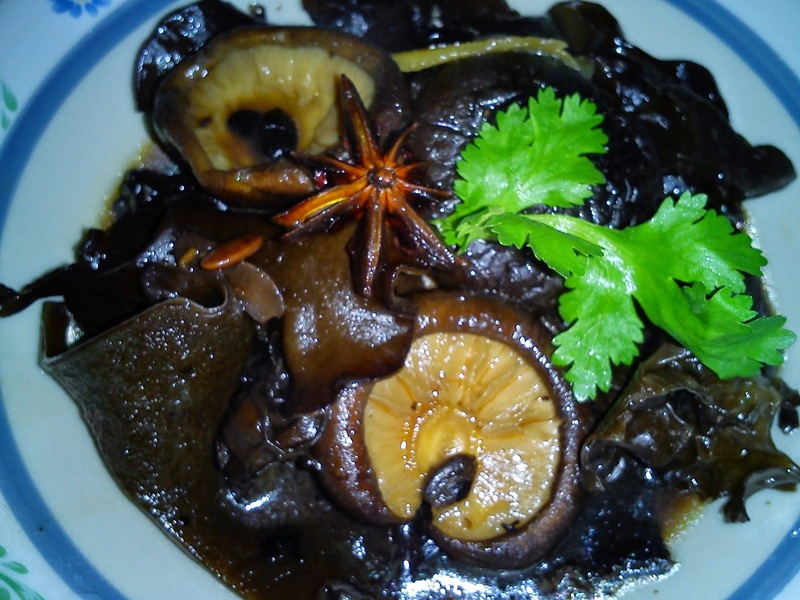 Add in black mushrooms and wood ear fungus. Stir fry until fragrant, add star anise, seasoning and water. Bring to boil over high heat then lower heat to simmer until sauce is almost dry. Add in cloud ear fungus, stir to mix well. An easy vegetarian dish to prepare yet tasty and good with plain white rice. 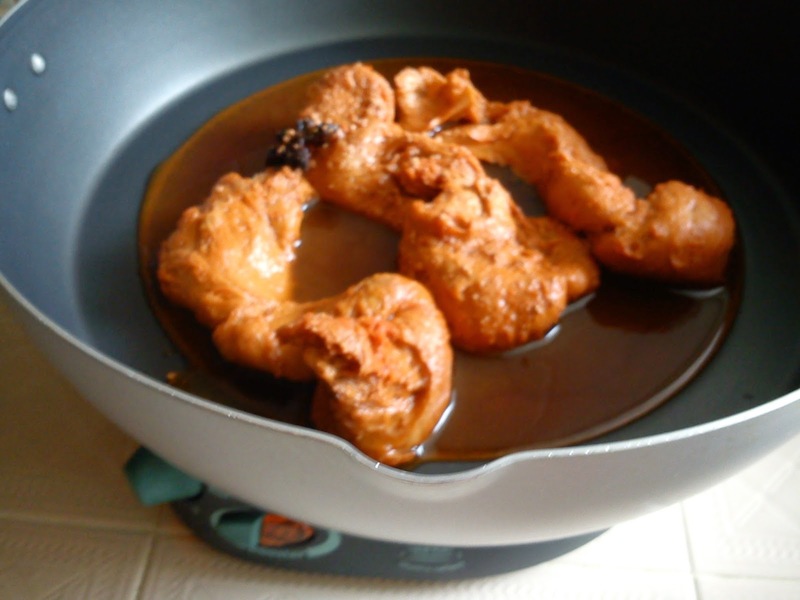 The recipe uses fresh tofu skin [aka tau pau] which comes in 2 shapes [round and oblong]. It comes in a packet of 10 pieces. For this dish, I used the round ones cos' I think it is easier to coat with the batter for frying. Heat oil in pan [preferably non-stick pan]. Coat tofu skin pieces with batter. Pan fry until golden brown and crispy on both sides. Dish and drain. Remove excess oil. 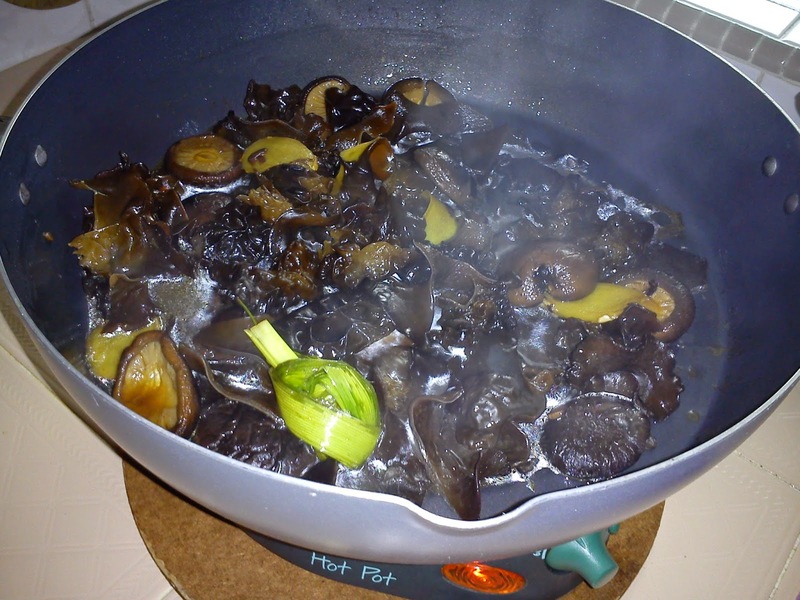 Saute ginger and mushrooms until fragrant. Add in the sauce ingredients and chilli. Bring to boil and return the fried tofu skin to coat well with the sauce. Dish up and garnish with coriander leaves. Serve. 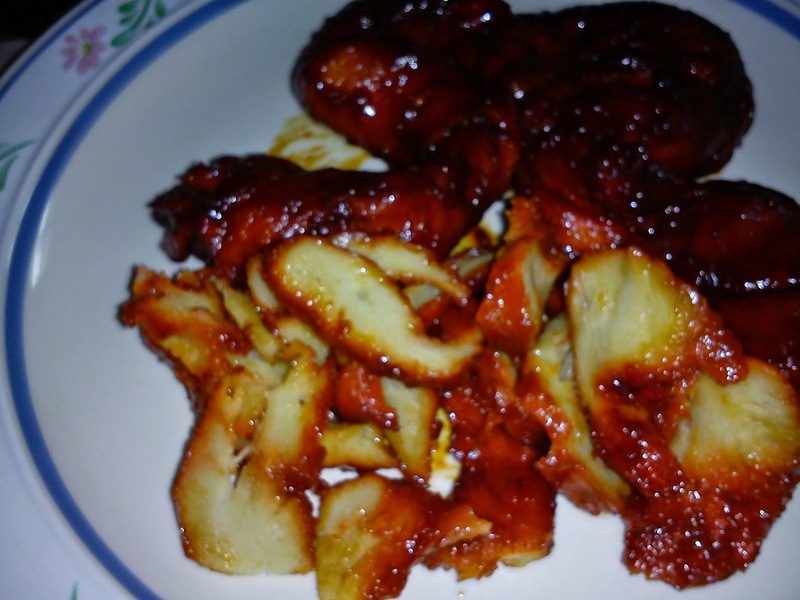 Made some mock char siu for vegetarian diet. This char siu can be eaten as it is or use as a condiment for stir fry vegetables, noodle and fried rice. This is made from ready-made gluten which are available at the stores selling vegetarian food ingredients. They are available fresh or frozen. I have modified this recipe for convenience and the mock char siu nevertheless tasted good but it is soft and not like char siu which sometimes are tough. Pull the raw meen kan/gluten into a cylindrical shape or into strips to resemble pork fillet. 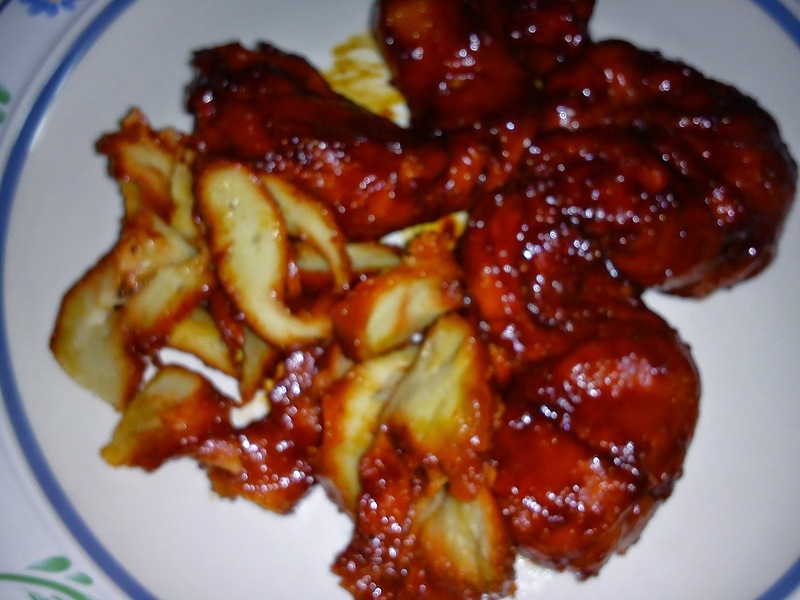 Marinate the gluten with marinade for several hours. 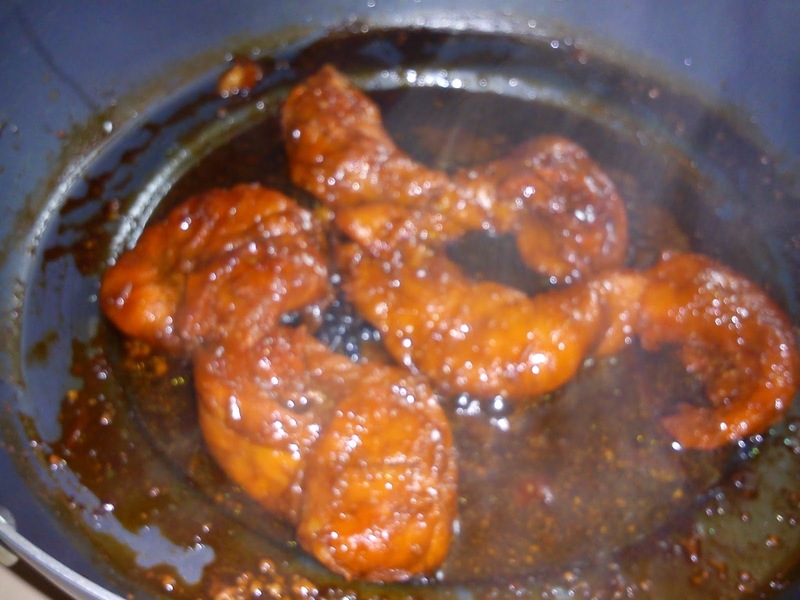 Place marinated gluten with marinate into a wok, bring to boil and simmer until gravy is reduce. 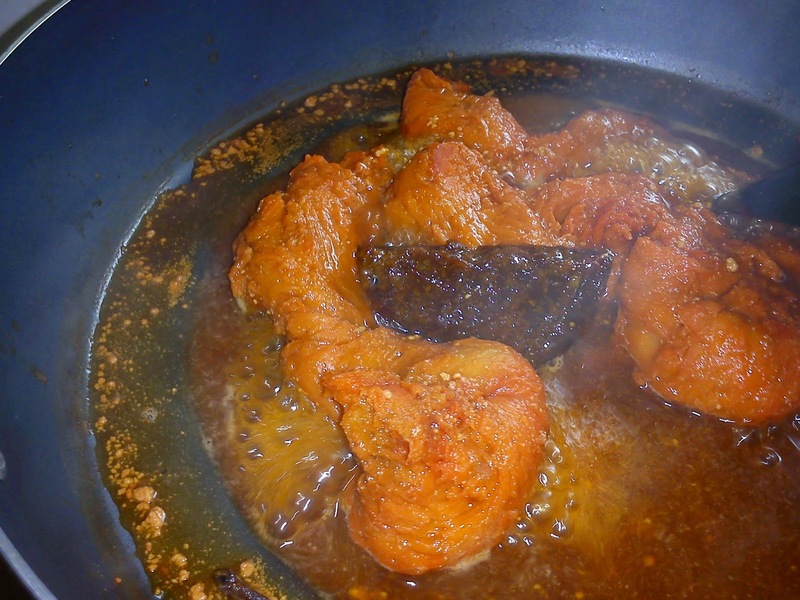 Add in palm sugar and simmer until gravy is thick. Dish up, slice to serve and garnish with some toasted white sesame seeds if preferred. This mixed vegetable pickle popularly known as 'Achar' are found in most economy rice stalls or at the stall at the wet market selling cooked food. However, theirs are usually with shallots in the curry paste. For religious purpose like Nine Emperor Gods Festival [Kew Ong Yeah in Hokkien],shallots and garlic must not be added. I cooked this annually during this festival for the family and to give some friends who are on strict vegetarian diet like me. In my previous post on this, I prepared the curry paste from stretch but this time, I bought the ready-mix paste [In Penang, this ready-mix paste is available at most wet markets. You just need to tell the vendor how much vegetables you are cooking and he will prepare the quantity needed]. For this recipe, the total weight of the wet paste is 375 gm. Season cut cucumber with some salt and set aside for 15-20 minutes. Place seasoned cucumber in a muslin bag and squeeze out the water. Do this in several batches. Drier cucumber will make it crunchy when cooked. 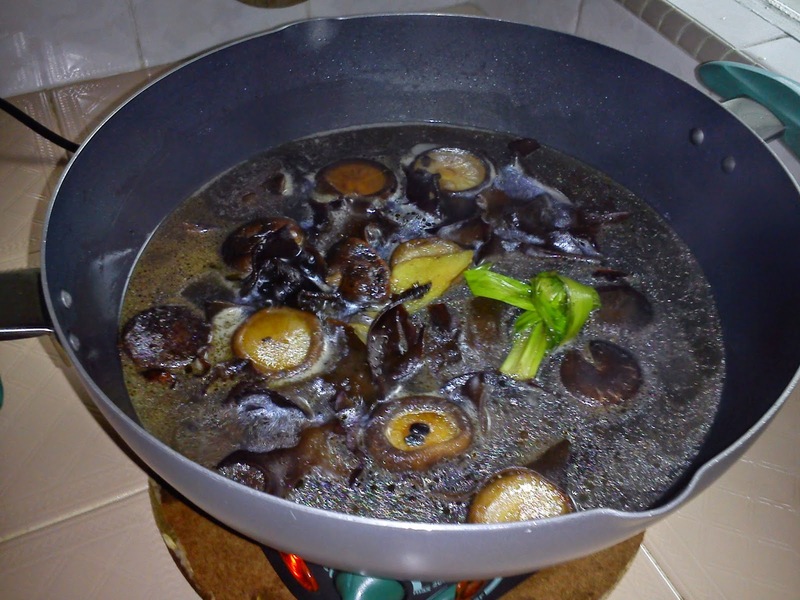 Bring water to boil in a wok then add in vinegar. Blanched each of the cut vegetables for about a minute and remove using a serrated ladle into a basin. Usually, I will blanch the cucumber first, followed by carrot/long beans and cabbage. Do not overcook the vegetables. Discard the water after all the vegetables are blanched. 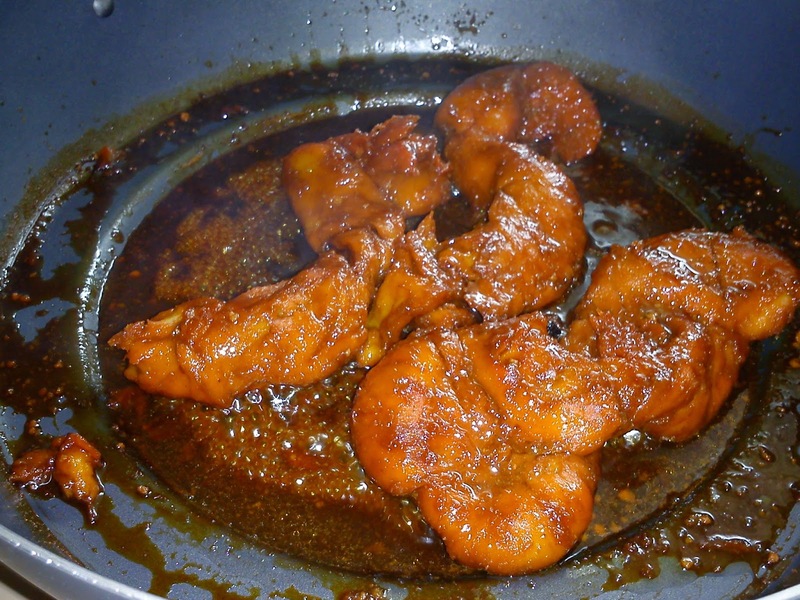 Heat up oil in the wok to saute the chilli paste till aromatic and oil separates. Add in half portion of sugar and salt. Fry to combine then add in all the blanched vegetables. Stir to combine the chilli paste and vegetables. Then add in the cut chillies, balance sugar and salt. 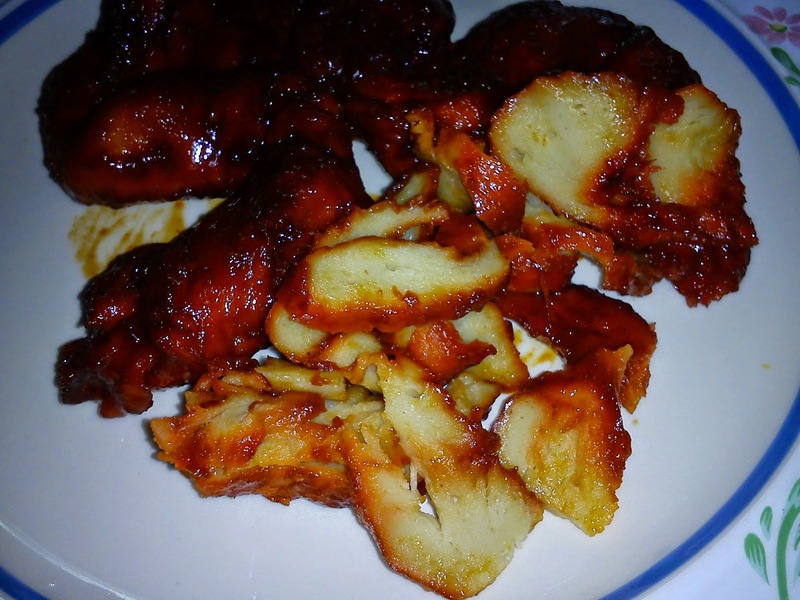 Taste to adjust seasoning [need not be too sweet, sour or salty as it tastes better after 1-2 days]. Bring it to a boil, lower heat then add grounded peanuts and sesame seeds [keep a little as garnish]. Mix well and off fire. Leave to cool before storing in containers. Sprinkle with sesame seeds when serving. Keep well for 2 weeks or more in refrigerator. Bring out and leave it to room temperature before serving with white rice. If cooking less, just adjust the quantity of the ingredients proportionately. Acar tastes better after several hours or even after several days. Acar stays good for at least 1/2 a month in the fridge. White carrots were very cheap at the supermarts. Traditional fried carrot cake is always my favourite kuih from the Kuih stall. They are deep fried until golden brown and the edges are especially crispy and fragrant but not that authentic cos' you don't get to taste the carrots in it. Most times you don't see the shredded carrots. Peel and finely grate carrots. Combine rice flour with water, mix until batter is smooth. Set aside. Heat some oil, fry carrots at medium heat until soft [about 5-10 minutes]. Add in the seasoning to taste, stir fry to mix well. Add in water, stir and bring to boil. Simmer for several minutes. Gradually add in the rice flour mixture, continue stirring as you add the mixture. Stir until the mixture thickens. Scoop mixture into a lightly greased baking tray [about 7-8"], smooth the surface a little. Steam over high heat for 40 minutes or until cooked through. Allow to cool before removing cake. Cut cake into desired shapes. Heat some oil in a non stick pan, pan fry cake pieces until golden brown are crispy on both side. You can deep fry the cakes too. Serve with dipping sauce or any chilli sauce of your choice. Cook sauce over medium heat, stirring all the time until sauce thickens. Let it comes to a rolling boil and bubbly. Off heat and leave to cool before storing in glass jar.